When establishing the United States, Thomas Jefferson and America's other Founding Fathers were inspired by the revolutionary ideas of 18th century Europe, a period known as the Enlightenment. Instead of relying on traditional faith and institutions, Europeans began to use reason and science as their guide. This new way of thinking would eventually break the chains of European monarchy and the theology that supported it. 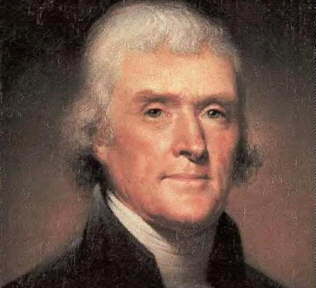 When Jefferson ran for the office of U.S. President, he correctly predicted that his opponents would use his writings in attempt to smear him. In the tumultuous election of 1800, New England's clergy, along with the conservative Federalist Party, vilified Jefferson as a "howling atheist" and "infidel." 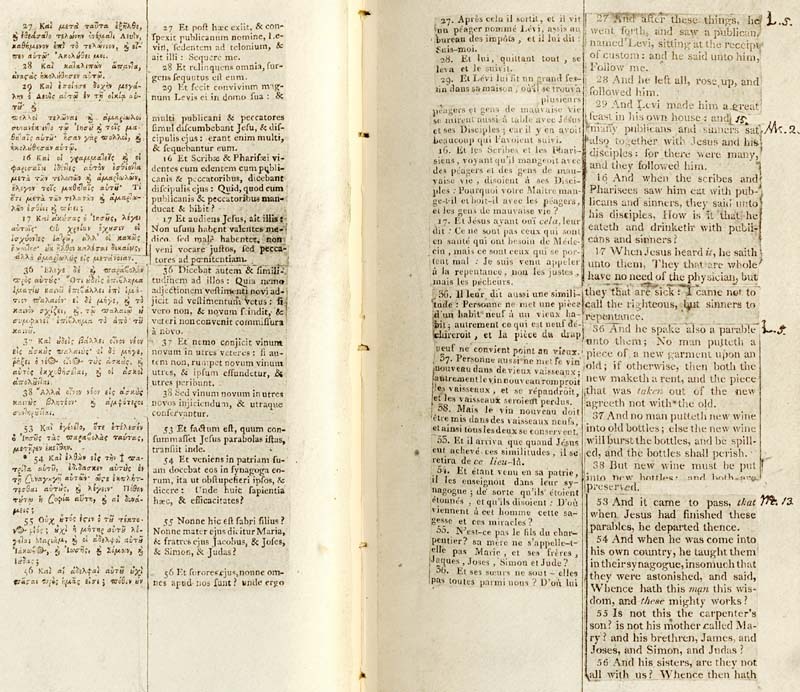 Toward the end of his life, Jefferson took Greek, Latin, French, and English extracts of the New Testament and cut and pasted together his own version of the Bible. His goal was to eliminate what he regarded as distortions in the Gospels. Jefferson believed that the New Testament was written by unlearned apostles who often misunderstood Jesus and misrepresented his teachings. Jefferson felt that his edited version of the Bible best expressed the moral code of what Jesus really taught. "[A] short time elapsed after the death of the great reformer of the Jewish religion, before his principles were departed from by those who professed to be his special servants, and perverted into an engine for enslaving mankind, and aggrandizing their oppressors in Church and State; that the purest system of morals ever before preached to man, has been adulterated and sophisticated by artificial constructions, into a mere contrivance to filch wealth and power to themselves; that rational men not being able to swallow their impious heresies, in order to force them down their throats, they raise the hue and cry of infidelity, while themselves are the greatest obstacles to the advancement of the real doctrines of Jesus, and do in fact constitute the real Anti-Christ." "[The apostle] Paul was the great Coryphaeus, and first corrupter of the doctrines of Jesus." "It is between fifty and sixty years since I read it [the Book of Revelation], and I then considered it merely the ravings of a maniac, no more worthy nor capable of explanation than the incoherencies of our own nightly dreams." "But it does me no injury for my neighbor to say there are twenty gods or no God. It neither picks my pocket nor breaks my leg." "Millions of innocent men, women and children, since the introduction of Christianity, have been burnt, tortured, fined and imprisoned; yet we have not advanced one inch towards uniformity. What has been the effect of coercion? To make one-half the world fools and the other half hypocrites. To support roguery and error all over the earth." "The common law existed while the Anglo-Saxons were yet pagans, at a time when they had never yet heard the name of Christ pronounced or knew that such a character existed." "For we know that the common law is that system of law which was introduced by the Saxons on their settlement of England, and altered from time to time by proper legislative authority from that time to the date of the Magna Charta, which terminates the period of the common law.... This settlement took place about the middle of the fifth century. But Christianity was not introduced till the seventh century; the conversion of the first Christian king of the Heptarchy having taken place about the year 598, and that of the last about 686. Here then, was a space of two hundred years, during which the common law was in existence, and Christianity no part of it.... That system of religion could not be a part of the common law, because they were not yet Christians." "His [John Calvin's] religion was demonism. If ever man worshiped a false God, he did. The being described in his five points is ... a demon of malignant spirit. It would be more pardonable to believe in no God at all, than to blaspheme him by the atrocious attributes of Calvin." "Fix reason firmly in her seat, and call to her tribunal every fact, every opinion. Question with boldness even the existence of a god; because, if there be one, he must approve the homage of reason rather than of blind-folded fear. Do not be frightened from this inquiry by any fear of its consequences.... If it end in a belief that there is no god, you will find incitements to virtue in the comfort and pleasantness you feel in its exercise and in the love of others it will procure for you."